In the work Connecting, Victoria Skogsberg recreates a popular ‘psi’ experiment that tests the possibility of receiving messages from the subconscious. 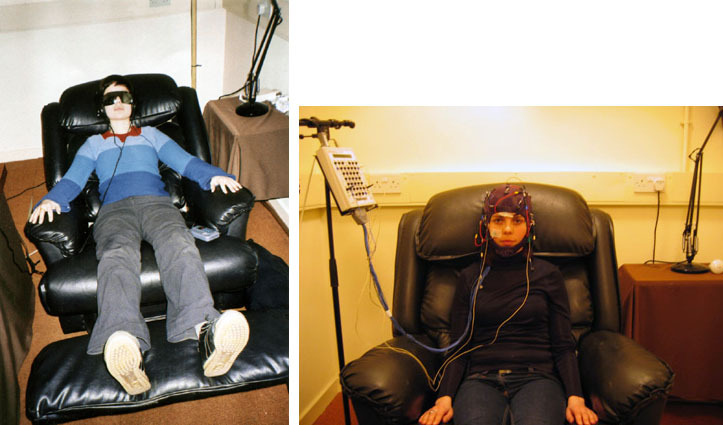 In the ‘real’ experiment the ‘receiver’ is situated in a sound proof room, seated on a comfortable reclining chair wearing headphones and large black glasses. White noise is played continually through the headphones and the glasses, equipped with stroboscopic lights, are programmed to emit red flashes into the eyes which allow the body to relax. Skogsberg’s re-creation contains similar props to the real experiment but takes place in what seems like a domestic environment excluding the apparatus and technical equipment we would assume to belong in such a place. Her image suggests that with the right state of mind and a few simple tools it may be possible for anyone to connect to a higher realm.